I based it on a recipe I found on the internet and changed up a few ingredients to suit our taste. but it is light and tasty and makes enough for a week's worth of salads. Combine all ingredients except grapeseed oil and boiling water in a blender. Add water and oil and process again until well mixed. Pour into dressing bottle and refrigerate until an hour or so before serving. Note: the dressing will separate in the bottle so it will need to be shaken well before serving. Dressing will keep in the fridge for up to 2 weeks. 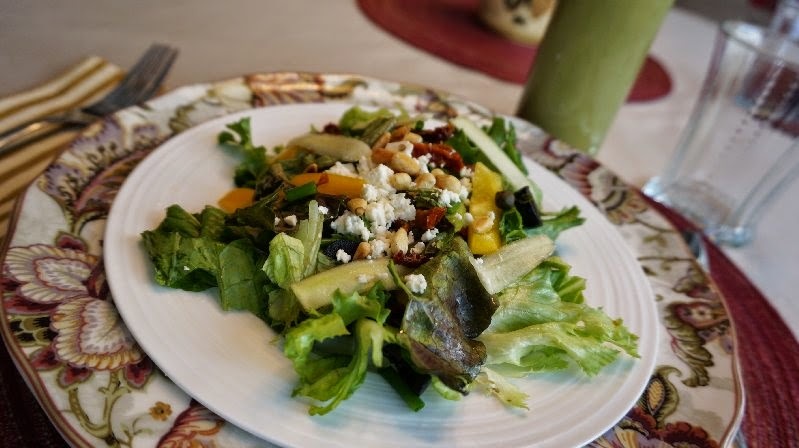 Mediterranean Salad - (this is the one in the picture) red lettuce, romaine, thinly sliced red onion, sun dried tomatoes (the moist ones in a package) sliced black olives, chopped yellow pepper, feta cheese and toasted pine nuts. *Add the black olives just before serving. Heat Dressing and thicken slightly with cornstarch and serve as a sauce over salmon or halibut. Your salad dressing sounds delicious! I am trying to eat more salads and this would make me look forward to a salad supper!